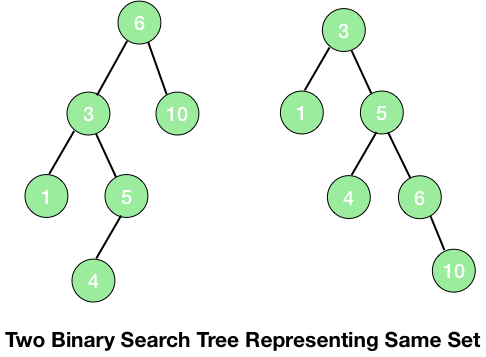 A binary search tree is a binary tree where for every node, the values in its left subtree are smaller than every value in its right subtree. In the above picture, the second tree is not a binary search tree. 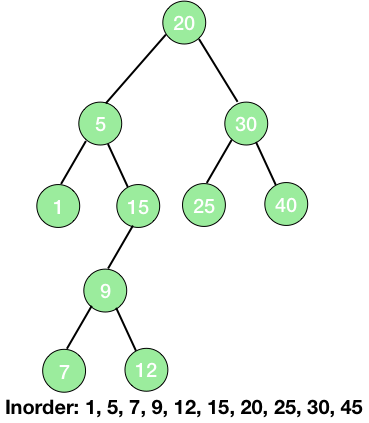 All the values in the left subtree of any node must be smaller than the values of the right subtree of that node but the here the value 8 is not smaller than 6. Hence, the second tree is not a binary search tree. Let's suppose we have to find a value in a binary search tree. 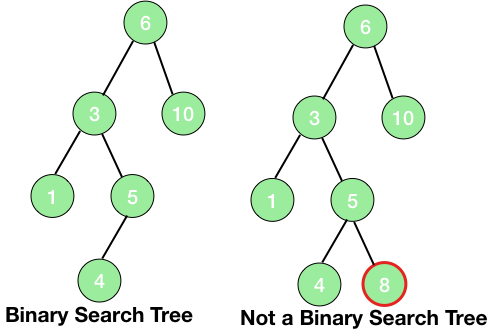 If we are on any node of a binary search tree and the value to be found is greater than the value at the node then we are assured that the value will lie somewhere on the right subtree and if it is smaller then on the left subtree and thus making the searching in a tree much efficient. One interesting point should be noted here that when the inorder traversal is applied on a binary search tree, it prints all the data of the binary tree in the sorted order. if(n.data == x) – We are simply comparing the data at the current node with the value to be found and if both are equal then we have found the value and thus returning the current node (which contains the value) in the next line (return (n)). else if(n.data > x) – If the data to be found is smaller than the data at the current node, then it must lie at the left subtree and thus we are again calling the search funtion on the left subtree. 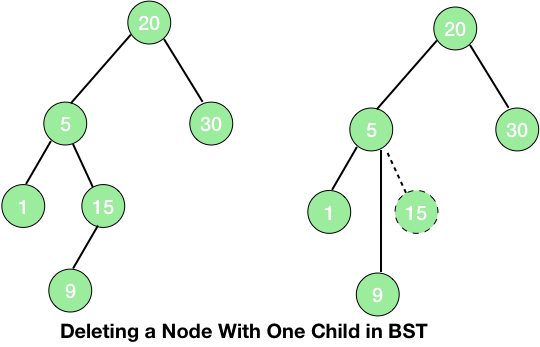 else – the data to be found is greater than the data at the current node and thus it must lie in the right subtree. So, we are implementing the search funtion to the right subtree in the next line. 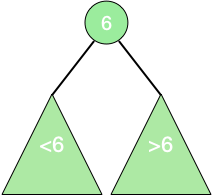 if(n.left==null) – There is no left child of the node and thus the current node is the leftmost node and thus it must hold the smallest value of the tree. else – Move to the left child. 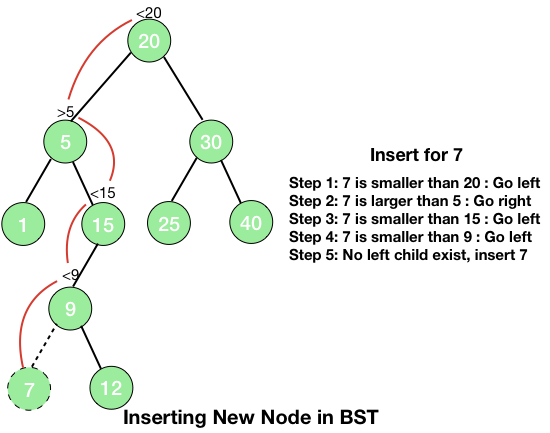 Similary, we can find the maximum element of a binary search tree at its rightmost node. Search for the element x. If the element is found, do nothing. The node is a leaf - This is the most simple case and here we can delete the node immediately without giving a second thought. The node has one child - This is represented in the picture given below. When the node to be deleted has only one child then just replacing the node with its child will maintain the property of the search tree. So, we just replace the node with its child i.e., link the parent of the node to be deleted to its child. Since both the node to be deleted and its child are on the same side and there are no further children, so the property of a search tree will be maintained. The node has 2 children - When the node to be deleted has 2 children, we need to choose a node to be replaced with the node to be deleted such that the property of the binary tree remains intact. When you look at the tree, you will find that either choosing the maximum element of the left subtree or the minimum element of the right subtree will satisfy this condition. We will proceed with choosing the minimum element of the right subtree and then we will delete the node. Now, the smallest element on the right subtree must have a single child or no child at all so, we can delete this node using either the first or the second case. Now you know the concepts of the binary search tree, the implementations in C and Java are can be found in the posts: Binary Search Tree in Java and Binary Search Tree in C.